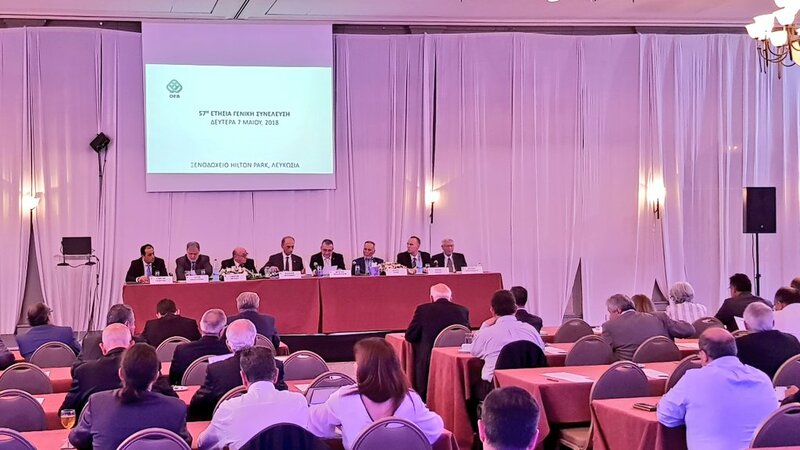 The Statute Part of the 57th General Assembly of the Cyprus Employers and Industrialists Federation took place in Nicosia yesterday afternoon with the participation of a large number of its members. The Formal Part of the General Assembly was cancelled, as the presence of the President of the Republic of Cyprus, Nicos Anastasiadis was impossible due to the death of his beloved mother. In the context of the General Assembly and following the consideration of internal issues of OEB, the President of the Federation, Christos Michaelides, addressed a speech in which, among other, noted the circumstances under which the Government of Nicos Anastasiadis undertook the Cypriot Economy in 2013, the toughest phase after the Turkish invasion. «We envision a modern Cyprus forward – looking, innovative, competitive that exceeds its size. With respectable institutions without interference and corruption, with transparent and efficient governance systems», OEB’ s Chairman said, adding that Federation’s 10000 members and 65 active associations are in constant contact with OEB, giving market pulse and real economy.